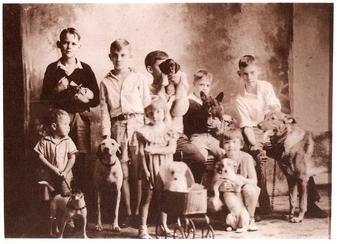 Comments: (Nee: ) | Somerset KY United States | 1921-1940 | Comments: It is a photo of 8 children,ranging in age from about 4 to about 14 each one holding a dog. Found in a McElroy photo album in Somerset,KY, but no one in the family recognizes any of the children (or the dogs). The photo may have been sent by relatives in another state (Ohio or Oklahoma) named Kilcoyne or Corrigan, or possibly Fitch.